ELLSWORTH, Oliver (1745-1807) was an American lawyer, judge, politician, and diplomat. He was a drafter of the United States Constitution, a United States Senator from Connecticut, and the third Chief Justice of the United States. 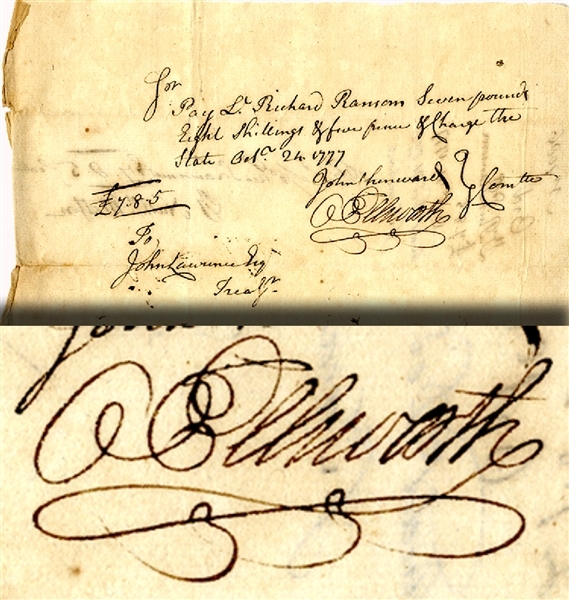 War-date Manuscript Document Signed “O Ellsworth” (as ordered by Treasurer John Lawrence, part of the committe of 5), 1pp. oblong octavo, October 24, 1777, and reads “Pay Lt. Richard Ransom Seven pounds eight shillings & five pence & charge the state...” Fine condition.